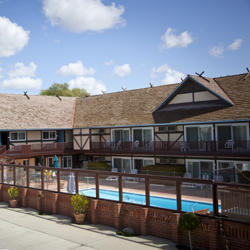 The King Frederik Inn is conveniently located in the heart of "Little Denmark, USA" with easy access to the annual Danish Days festival and other popular attractions in Solvang. Hotel guests are within walking distance to the historic Santa Ines Mission, local wineries, shops, Danish bakeries and gourmet restaurants. We are located across the street from Solvang Festival Theater, where you can experience theater under the stars. Outdoor recreation includes beautiful golf courses, hiking, biking as well as boating and fishing at Lake Cachuma. The hotel offers a complimentary continental breakfast that is served daily with fresh Danish pastries. Other hotel amenities include a heated outdoor pool and spa. Each well-appointed room features free high-speed Internet, cable satellite television with HBO®, and refrigerators are available in select rooms. A friendly multilingual staff is ready to ensure a comfortable and memorable stay with 24 hour service.